Flipping pancakes? Flip through the reviews to find the best electric griddle! It has become a family tradition in my household to make pancakes every Saturday morning (chocolate chip, naturally). With 2 kids and a very hungry husband, I end up making a lot of pancakes. In my standard 11” pan, it takes quite a while. For a frequent pancake cooker like myself, an electric griddle is a great solution. Now to find the best electric griddle for my cooking purposes! Presto makes a number of high-performing electric griddles. This is probably its most popular one, for good reason. It is made of heavy duty cast aluminum with a smooth, non-stick finish. It has a groove along one side with a hole that lets into a removable grease trap. The heat control, which goes from low to 400°F, can be removed so that the griddle can be fully submerged in water for thorough cleaning. The greatest strength of this griddle seems to be the heavy construction of the griddle pan itself. This griddle does feel much heavier than many others on the market, which is important as many are prone to warping over time. It is some of the other pieces that seems to have issues—the plastic handles and plastic grease trap are flimsy in comparison. Some users have experience chipping issues with these parts. As with most mass-produced items, this one does seem prone to manufacturing inconsistencies, such as slightly warped plates that cause pooling in the center. Overview: The Secura Electric Reversible griddle and grill combo is an excellent choice, especially if you have limited space and need to reduce the number of appliances you have. It has some nice features that make it a great option. I also like that the grill pan is enclosed in a case, which makes it safer from curious little hands in the kitchen! It is the only choice in this round up with a lid—a great feature when cooking foods prone to splattering like bacon. It also has a reversible plate that is smooth on one side and ridged for more grill-like cooking on the other. This offers some nice flexibility and I always love kitchen gadgets the perform double-duty! It’s also fairly easy to take apart for cleaning the pieces. The main drawbacks with this grill seem to be that the lid, which can be removed for cleaning, can become difficult to get in and out smoothly. The removable grease trap also seems to be too small, allowing drippings to fall and cause a bit of a mess. This Cuisinart Griddler promises to do just about everything you’d think to do with a countertop griddle. 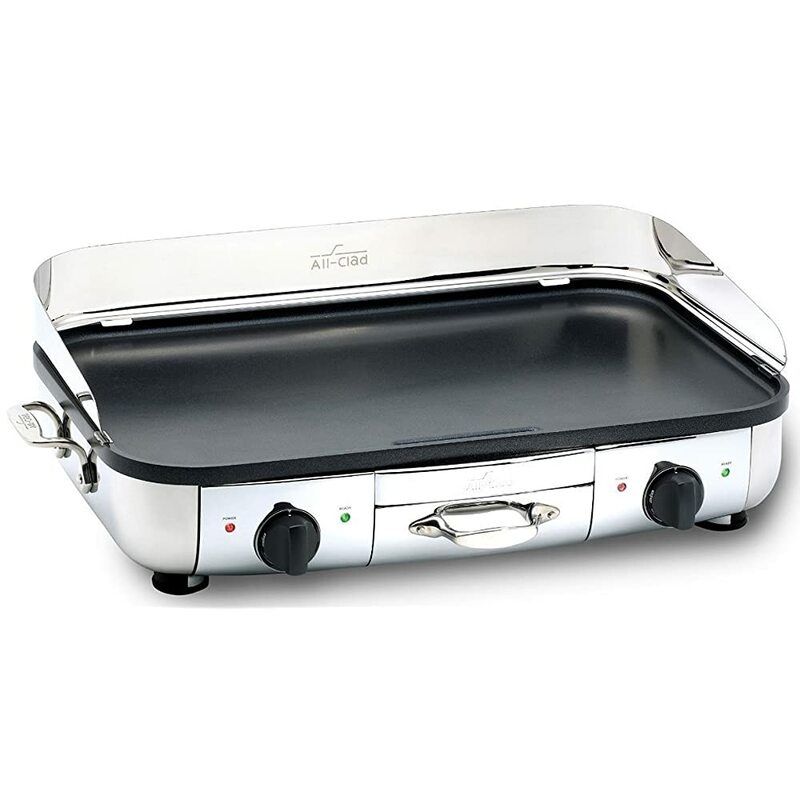 The five functions refer to its ability to be used as a contact grill, a panini press, a full grill, full griddle, and half-grill and half-griddle. Each side has a reversible flat-to-grill plate, and separate waffle plates can also be purchased to turn it into a waffle iron. From its hefty stainless steel exterior to the choice of black or Wolf-like red knobs, it’s a handsome piece of equipment. It can be used as a full griddle when opened up flat, or you can use just half of it, as it has separate temperature controls for each side. When fully opened, it offers a generous 23” x 9” of cooking area. As is often the case with multi-use products, I find some of the functionality is lost in the bells and whistles. For example, when the unit is fully opened, there’s obviously a break between the two sides that you then have to work around. Some people may find this minor, but I feel like part of the purpose of a big griddle is to have a nice, open cooking space. Some users also experienced issues with the plates having different heat levels, the thermostat cycling on and off at high temperatures, and the plastic pieces that hold the grilling plates melting. All-Clad is best known for its high-quality cookware. It repeats some of its signature features, such as the branded cast handles in this electric griddle. This electric griddle also features a removable grease trap, a splatter guard at the back, and a dual-temperature function. The nonstick cooking surface is made from a hard anodized aluminum. This makes it very durable and long-lasting, and offers a stick-resistant surface even if the chemical non-stick eventually wears off (which is seems to do). Despite its hefty price tag, there do seem to be some issues with this griddle. The most common complaint is that the included scraper to clean the griddle actually scratches the non-stick surface. A friend who owns this griddle has complained that it has hot spots, which she’s gotten used to, but shouldn’t be present on such an expensive appliance. I also do not like that the griddle plate cannot be removed or detached from the heating elements for cleaning. Have you ever seen an open-kitchen in a diner or burger joint? They work on a huge, open cooking surface, so the cooks can continuously pump out a large amount of food like pancakes, bacon, burgers, etc. An electric griddle mimics this style of cooking but scales it down for home use. The basic idea is to have a flat, fairly large, metal cooktop, heated from underneath with electrical elements. Many people think of an electric griddle as a breakfast appliance—and it is great for breakfast foods! The most obvious is pancakes, because you can cook a whole batch of pancakes on a griddle. Bacon, eggs, omelettes, French toast, crepes, sausages and all sort of breakfast foods are also great to prepare on the griddle. But an electric griddle can work all day. Nearly anything you’d be cooking in a pan on the stovetop that doesn’t have a runny sauce can go on a griddle: grilled cheese sandwiches, quesadillas, sautéed vegetables, fish, hamburgers. In Thailand, one of the best pad thai’s I tasted was made on an electric griddle at a little street food stall! But is it just another cooking appliance that’ll collect dust in a kitchen cabinet? With such a wide variety of electric griddles on the market, it’s possible to find one with lots of bells and whistles. But of course, the most important question is how it cooks. When we’re talking about a large cooking surface, it must heat evenly for it to be effective. You want to utilize the entire surface (that’s the whole point! ), so it’s important that the surface not have cold spots that will undercook your food, or make it hard to judge cooking times. Most users want a non-stick surface for an electric griddle. The non-stick can either be achieved with a chemical, non-stick coating (such as Teflon), or by the material used such as ceramic. Both require special care, such as avoiding metal utensils and harsh abrasives when cleaning to keep the non-stick surface in tact. Although chemical non-stick components such as Teflon are generally regarded as safe, there are some concerns, both environmental and health-related. Chemical non-stick can break down at high temperatures and flake, so that may be something to keep in mind. Another consideration is how much control you have over the heat. Some griddles will have simple low-medium-high options, whereas others will have a fuller thermostat. Some even have dual thermostats that allow you to set two different temperatures on different sides of the griddle. Most griddles allow the grease in the foods to slide off the griddle, which means you’re consuming less of this fat. Sometimes the grease simply rolls off the cooking surface into grooves around the edge; some griddles include a grease trap that you remove and empty (convenient if you’re cooking a large, greasy meal!). Some electric griddles have handles. Some hinge in the middle so they can be used like a panini press or waffle iron. These often have different metal plates, like a waffle plate or grilling plate, that can be changed in and out depending on what you’re making. Some electric griddles have a warming tray under the cooking surface. I love the idea of this feature as then there’s no need to turn on your oven to keep the cooked food warm while you finish the rest of the meal. However, in all of my hunting, I haven’t yet found one that seems to function well! When it comes to finding the best electric griddle on the market, there are a lot of options! I like to go back to the original reason you want the product, because you can get lost in the many choices. For me, the purpose of an electric griddle is to have a large, uninterrupted cooking surface on which you can cook a bunch of food. I tend to think that simple is best. In this case, the classic-looking Presto griddle wins. It’s easy to use, easy to clean, and perfectly fits that need for a diner-like griddle right in your own kitchen. The inexpensive investment is a bonus! Now that we’ve found the best electric griddle, it’s time to flip up some pancakes like a true breakfast joint! Here’s the recipe I use every weekend from AllRecipes.com (I add a splash of vanilla to the batter!). Have you found the best electric griddle? Let us know! What to Look for to Find the Best Springform Pan for Magic Baking!